By New Zealand law, employers are required to contribute to their employee’s KiwiSaver account or complying fund at 3% of their gross salary or wage if the employee has joined Kiwisaver. However, when you look into your KiwiSaver contribution transaction record as an employee, you may notice the employer contribution amounts are less than your employee contribution. If you join KiwiSaver and contribute 3%, your take home pay will be $1200 – 225.77 (PAYE) – 16.68 (ACC) – 36 (KiwiSaver) = 921.55. On your KiwiSaver statement, your contribution will be $36, however, your employer contribution will be $25.2, not $36. Why? The reason is that employer contributions are taxed under Employer Superannuation Contribution Tax (ESCT). 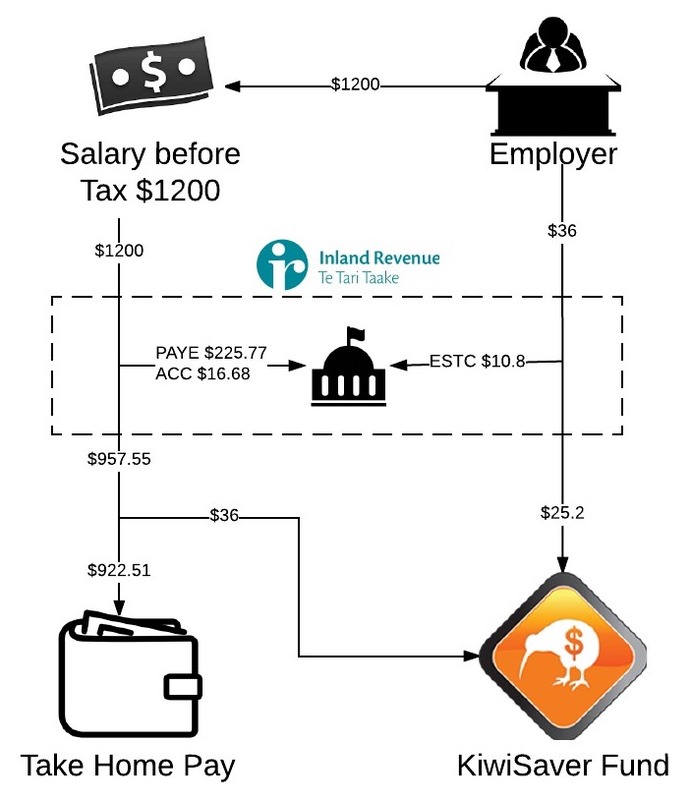 Your employer pays out an extra 3% of your income to KiwiSaver but part of that went to IRD as tax. Here is the tricky part, on the employee contribution, it was calculated based on pre-tax income and taken out of after-tax income. So the $36 will be taken out after they deduct PAYE and ACC and that $36 will reach your KiwiSaver fund without IRD taking out any more tax. Therefore, I was wrong by saying you will have 100% return on your employee contribution. It’s more like 67%-89.5% return. It’s still an unbeatable risk-free guaranteed return and one of the best investment in New Zealand.